Real Tigers is the third book in Mick Herron's series about Jackson Lamb and the 'slow horses' - a team of MI5 agents who, due to character flaws or past mistakes, have been shunted off to Slough House, where they spend their days sifting through data and compiling pointless reports. Lamb himself is a Cold War veteran gone to seed whose shambling, slobbish exterior conceals a sharp, wily cunning and the previous books have seen him and his team become embroiled - with varying degrees of legitimacy - in operations that are as much about conflicts within the service itself as they are about national security. Real Tigers takes this to the next level. Kickstarting the action is the kidnap of Catherine Standish, a recovering alcoholic whose role is primarily that of Lamb's PA. Lamb's operation to free Catherine and tackle the kidnappers is heavily entangled with internal service politics, with Home Secretary Peter Judd - whose mop-haired, bumbling public school buffoon persona is a front for a vicious, power-hungry bully, if that helps you guess who he might be based on - playing a key part. Like the other books in the series (Slow Horses and Dead Lions) Real Tigers is full of complicated machinations and double-dealing - so much so that it's occasionally a little hard to keep track of who's on whose side - but it's really the characters and the dialogue between them that makes it such fun to read. Mick Herron writes dialogue that is sharp and witty, even laugh out loud funny at times, and some characters who were perhaps less three-dimensional in the earlier books are more fleshed out here. Socially inept hacker Roderick Ho, for example, has developed a mildly disturbing crush on Louisa Guy, who in turn is doing her best to deal with the death of her colleague and boyfriend Min Harper while slogging her way through work so dull that it doesn't even provide a distraction. There's more of a role here too for Marcus and Shirley, who were introduced in Dead Lions and both appear to have addictions about which they're greatly in denial. The plot builds to an action-packed and extremely fast-paced climax, although oddly, this was the one sequence that worked less well for me; it just felt too frenetic and a little too much. However, I do generally prefer mystery and detection to guns and fights, so someone more attuned to action thrillers than me would probably welcome this element of the story a lot more than I did. 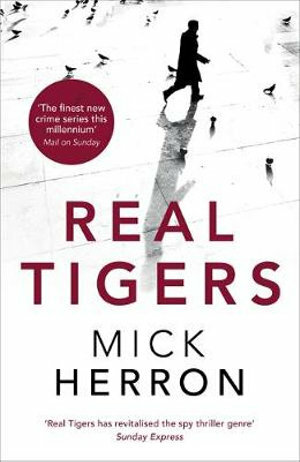 Overall, Real Tigers is another cracking read from Mick Herron, delivering exactly what readers of this series will want from Jackson Lamb. It comes to a pleasingly neat conclusion while also leaving plenty of scope for certain aspects of the story to be further developed in the next book in the series, Spook Street, which was published on 9 February. I was kindly provided with an advance copy via the publisher, which I will read and report back on very soon.